In 1928 Ben Hecht and Charles MacArthur wrote The Front Page, the greatest newspaper comedy of them all; Howard Hawks directed this version of it - a spastic explosion of dialogue, adapted by Charles Lederer, and starring Cary Grant as the domineering editor Walter Burns and Rosalind Russell as Hildy Johnson, the unscrupulous crime reporter with printer's ink in her veins. (In the play Hildy Johnson is a man.) Overlapping dialogue carries the movie along at breakneck speed; word gags take the place of the sight gags of silent comedy, as this race of brittle, cynical, childish people rush around on corrupt errands. Russell is at her comedy peak here - she wears a striped suit, uses her long-legged body for ungainly, unladylike effects, and rasps out her lines. And, as Waiter Burns, Grant raises mugging to a joyful art. Burns' callousness and unscrupulousness are expressed in some of the best farce lines ever written in this country, and Grant hits those lines with a smack. He uses the same stiff-neck, cocked-head stance that he did in Gunga Din: it's his position for all-out, unsubtle farce. He snorts and whoops. His Burns is a strong-arm performance, defiantly self-centered and funny. 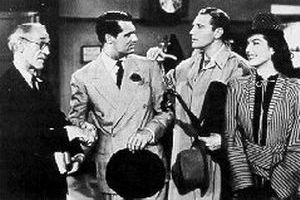 The reporters - a fine crew - are Ernest Truex, Cliff Edwards, Porter Hall, Roscoe Karns, Frank Jenks, Regis Toomey; also with Gene Lockhart as the sheriff, Billy Cilbert as the messenger, John Qualen, Helen Mack, and Ralph Bellamy as chief stooge - a respectable businessman - and Aima Kruger as his mother. -Pauline Kael, 5001 Nights at the Movies.